There’s a lot of excitement these days about a type of cellular immunotherapy known as CAR-T, a method of modifying peoples’ immune cells to fight cancer. But you could also fill a book listing all the problems its makers will have to solve—how to test, manufacture, and even the define the nature of these cancer-killing cells—before the CAR-T story is a successful one. These hurdles, not the hype, were the subject of a panel of experts from industry, academia, and the FDA at the Inaugural International Cancer Immunotherapy Conference in New York Thursday afternoon. The panelists included University of Pennsylvania professor Carl June, whose work has led to programs now in clinical testing at Novartis; Adaptimmune executive vice president Gwendolyn Binder-Scholl; and GlaxoSmithKline’s head of immuno-oncology Cedrik Britten, among others. CAR-T stands for chimeric antigen receptor T cell, which describes an engineered version of the immune system’s attack dogs. CAR-T cells are a patient’s own T cells altered outside the body to be cancer killers, then put back in to go after tumor cells. CAR-T therapies from Novartis, Juno Therapeutics (NASDAQ: JUNO), and Kite Pharma (NASDAQ: KITE) have produced impressive results so far for certain blood cancers, leading to long-lasting remissions in some patients. But the field is early in its development. Researchers are trying to figure out how to make these therapies useful for more common cancers, such as lung, breast, and ovarian, and how to mitigate the overactive immune responses they can cause. Biotechs and pharma companies developing autologous therapies—which modify the cells of each individual patient—are wrestling with how to manufacture and distribute them at scale. But a different, larger question looms, and it gets to the heart of why autologous T cell therapy is truly a new medical frontier. The cells that are delivered back into the patient are not what ends up doing the bulk of the therapeutic work. The panelists Thursday noted how T cell therapies could throw a wrench into a typical, and crucial, clinical strategy. Early in the clinical testing of a drug, companies usually run what are known as dose escalation studies. Different doses of products are tested, low to high, to establish a trend of responses, see what safety issues pop up, and pick the optimal dose to move forward. Adaptimmune’s Binder-Scholl called for more guidance from regulators to help figure out a more standardized scheme for dose escalation studies. Henry R. Black, MD: Hi. I’m Dr Henry Black. I’m adjunct professor of medicine at the Langone New York University School of Medicine, and I’m here today with my long-term friend and colleague, Dr Bill Cushman. Bill, thank you very much for doing this. William C. Cushman, MD: Delighted to be here. Dr Black: What I want to talk about is the SPRINT study,which you’ve been a primary participant in. The top-line resultswere just released. Tell us a little bit about SPRINT: who was in it, what the hypothesis was, and how it compares to the ACCORD study, which you also participated in. Dr Cushman: Sure. I’m Dr Bill Cushman. I’m from Memphis, Tennessee. And I’m chief of the preventive medicine section at the VA and professor of preventive medicine at the University of Tennessee. I was a network principal investigator in SPRINT, which meant that I oversaw about a quarter of the sites. SPRINT was a study sponsored by the National Institutes of Health (NIH), primarily the National Heart, Lung, and Blood Institute (NHLBI). But other institutes—the National Institute of Diabetes and Digestive and Kidney Diseases, the National Institute on Aging, the National Institute of Neurological Disorders and Stroke—were also involved. SPRINT was a study of 9361 participants who were randomized to either a lower, more intensive goal of less than 120 mm Hg systolic blood pressure (SBP) compared with a goal of less than 140 mm Hg systolic. That was considered standard when we designed the study, and all guidelines recommended at least getting below 140 mm Hg. We recruited a participant pool of high-risk hypertensive patients with SBPs of ≥130 mm Hg. They could be on medications (the majority were), but they didn’t have to be. Participants not only had to have elevated blood pressure, but they also had to be above age 50 and they had to have some other indices of risk: known cardiovascular disease, chronic kidney disease, or being above age 75, for example, or having a Framingham risk assessment for cardiovascular disease of ≥ 15% over 10 years. They were randomly allocated to these two groups, with the intent of being followed for about 5 years. The primary outcome in SPRINT was a combined cardiovascular outcome that included myocardial infarction (MI), acute coronary syndrome other than MI, stroke, heart failure, or cardiovascular death. Now, there are a lot of other outcomes in SPRINT, including whether this lower blood pressure goal would prevent dementia, changes on MRI, or chronic kidney disease. Those outcomes have not been stopped or announced yet, and we’re still collecting data on that. The cardiovascular outcomes were viewed as so positive in terms of the benefit that the Data and Safety Monitoring Board recommended to Gary Gibbons, the director of the NHLBI, that the cardiovascular part of the trial—and the intensive intervention in particular—should be stopped and that the investigators and the participants should be unblinded. And that was done. Dr Black: Were the antihypertensive regimens prescribed, or was it whatever the docs wanted to do? Dr Cushman: Good point. We actually recommended using the major classes that were proven to be of benefit in cardiovascular outcome trials in hypertension: either thiazide-type diuretics, ACE inhibitors, angiotensin receptor blockers, or calcium blockers. It was primarily those four classes, and they could be combined in whatever way the investigators wanted. We did put a lot of emphasis on using thiazide-type diuretics because of the ALLHAT results. But the way they could be combined was really up to the investigators. Now, if the participants had known coronary disease or some other indication for a beta-blocker, that could certainly be used. And then other drugs could be added. We had a very large formulary representative of all the major classes of drugs— not only those classes, but also beta-blockers, alpha blockers, aldosterone inhibitors (spironolactone or amiloride, for example). We had a lot of drugs available. They were predominantly purchased for the study, by NIH. There were only two drugs that were donated by the pharmaceutical companies. The study was entirely funded by NIH. Dr Black: How is this different from ACCORD? Dr Cushman: In ACCORD, we had the same two SBP goals: less than 120 mm Hg compared with a SBP of less than 140 mm Hg. However, SPRINT is twice as large as ACCORD. As you may remember, we did not show a significant benefit for the lower SBP goal for the overall cardiovascular outcome in the ACCORD trial. We did see a significant reduction in stroke of about 40%, but that was a secondary outcome. The primary outcomes in mortality were not reduced in ACCORD. However, ACCORD was about half the size of SPRINT. And even though the ACCORD blood pressure study was done in patients with diabetes, on average, they were probably a little lower-risk than our SPRINT participants because of their somewhat younger age (average age, 62 years), the absence of real chronic kidney disease, and several other reasons. Even though ACCORD didn’t show a statistically significant benefit, it did show a 12% reduction in the cardiovascular outcome with a confidence interval that could have included up to a 27% benefit. In contrast, SPRINT was twice as large, with a higher-risk population with an older average age. We excluded people with diabetes because that was being looked at in ACCORD. And we excluded people who’d had a prior stroke because that was being looked at in the SPS3 post-stroke study in terms of blood pressure goals. Despite that, we had a very high-risk population. And what we found was about a third of a reduction in the primary cardiovascular events. That was significant. We also saw, quite importantly, about a 25% reduction in all-cause mortality. That was surprising. The results are quite clear that there’s dramatic benefit in terms of both cardiovascular events and total mortality. Dr Black: You probably can’t tell us this yet, but what was the blood pressure achieved in the less-than-140 group compared with the less-than-120 group? STOCKHOLM ( updated with commentary ) — Patients with type 2 diabetes and established cardiovascular disease receiving the glucose-lowering agent empagliflozin (Jardiance, Boehringer Ingelheim/Lilly), a sodium glucose cotransporter-2 (SGLT-2) inhibitor, were less likely to die than those taking placebo in the large, much-anticipated EMPA-REG OUTCOME study, hailed here as a landmark trial. The benefit on survival was seen regardless of the cause of death — empagliflozin prevented one in three cardiovascular deaths, with a significant 38% relative risk reduction in cardiovascular mortality, as well as a significant 32% relative reduction in all-cause mortality. CV death was one component of the primary composite outcome, which also included nonfatal myocardial infarction (MI) or nonfatal stroke. It was the CV mortality benefit, however, that primarily drove the reduction in this end point. This is a first in my lifetime — a diabetes drug trial that has shown improved outcomes in high-risk cardiovascular patients. Dr Inzucchi was given multiple rounds of applause as he presented the findings of EMPA-REG OUTCOME here at the European Association for the Study of Diabetes (EASD) 2015 Meeting, The study was also published simultaneously in the New England Journal of Medicine, by a team led by Bernard Zinman MD, director, Diabetes Centre, Mount Sinai Hospital, Toronto, Ontario. Cohen’s Brain Bits: Let the Sunshine in? Vitamin D is actually not a vitamin at all — it is a group of fat-soluble steroid hormones responsible for a host of important functions in the body. As it is found in low levels in most foods other than fish and dairy, vitamin D is primarily synthesized from cholesterol in the skin upon exposure to UVB radiation. While the discovery of vitamin D nearly a century ago stemmed from its role in calcium homeostasis and metabolism, an abundance of studies in the past decade have demonstrated the critical role vitamin D plays in neuronal development and protection. Indeed, in the past few years, researchers have uncovered an association between vitamin D deficiency and an array of important neurologic diseases. A study in this week’s JAMA Neurology investigated the relationship between vitamin D levels, as measured in the blood as 25-hydroxyvitamin D, and the rate of cognitive decline in a population of 382 multi-ethnic older adults. Both vitamin D insufficient (12-20 ng/mL) and deficient (<12 ng/mL) participants demonstrated accelerated cognitive decline in multiple functional domains, especially episodic memory and executive function, that are the domains most affected in patients with Alzheimer’s dementia. Previous studies have emphasized the essential role of vitamin D in the brain and have raised concern about the effect of vitamin D deficiency on the brain. Vitamin D’s neuroprotective roles include stimulation of neurotrophin release, neuroimmunomodulation, and interaction with reactive nitrogen and oxygen species. Vitamin D appears to also play a role in neurodevelopment through its regulation of nerve growth factor synthesis. Imaging studies have found increases in white matter hyperintensities and enlarged ventricles in vitamin D deficient study participants. Complex networks are noisy, whether they constitute food webs, power grids, or cells. And when networks buzz and crackle beyond normal bounds, bad things can happen: ecosystems can collapse, power grids can leave us in the dark, and cells can tumble into cancerous states. All these networks are amenable to similar mathematical treatments says a scientific team at Northwestern University. The team, led by physicist Adilson E. Motter, Ph.D., substantiated this claim by focusing on a particularly difficult biophysical problem: the rational control of cellular behavior. To date, attempts to exert such control have been frustrated by the high dimensionality and noise that are inherent properties of large intracellular networks. Dr. Motter and his colleagues noted that the response of biological systems to noise has been studied extensively. Yet they also realized that little had been done to exploit noise, or to at least channel it. They hoped to find a way to do so and thereby demonstrate the possibility of preserving or inducing desirable cell states. Essentially, by leveraging noise, the team found that the high-dimensional gene regulatory dynamics could be controlled instead by controlling a much smaller and simpler network, termed a “network of state transitions.” In this network, cells randomly transition from one phenotypic state to another—sometimes from states representing healthy cell phenotypes to unhealthy states where the conditions are potentially cancerous. The transition paths between these states can be predicted, as cells making the same transition will typically travel along similar paths in their gene expression. The team began by using noise to define the most-likely transition pathway between different system states, and connecting these paths into the network of state transitions. By doing so, the researchers could then focus on just one path between any two states, distilling a multidimensional system to a series of one-dimensional interconnecting paths. Then, using their computational approach, the team identified optimal modifications of experimentally adjustable parameters, such as protein activation rates, to encourage desired transitions between different states. A protein embedded in the surface of mitochondria opens the door to apoptosis, causing cells to experience severe power failures, according to new work by researchers at Temple University School of Medicine. The study, appearing in Molecular Cell, suggests that blocking the door with a small-molecule inhibitor could be key to the treatment of cardiovascular diseases such as heart attack and stroke, where extensive mitochondrial dysfunction and cell death hinder tissue recovery. The study (“SPG7 Is an Essential and Conserved Component of the Mitochondrial Permeability Transition Pore”), led by Muniswamy Madesh, Ph.D., associate professor in the department of biochemistry, the Cardiovascular Research Center, and the Center for Translational Medicine at Temple University School of Medicine (TUSM), shows that the protein, spastic paraplegia 7 (SPG7), is the central component of the so-called permeability transition pore (PTP), a protein complex in the mitochondrial membrane that mediates necrotic cell death (death caused by cell injury). The identification of SPG7 marks a major advance in scientists’ understanding of how the PTP affects necrosis. Although first described in 1976, the molecular parts of the pore have eluded discovery. “The only known molecular component of the PTP prior to our discovery of SPG7 was a protein called CypD, which is necessary for pore function,” Dr. Madesh explained. To identify genes that modulate PTP opening induced by calcium overload or increased levels of reactive oxygen species (ROS), the two primary factors that cause mitochondrial dysfunction and cell death via pore opening, Dr. Madesh’s team devised an RNA interference-based screen in which the activity of each gene under investigation was knocked down, or silenced, to examine its effects on mitochondrial calcium levels. The researchers began with a panel of 128 different genes but after initial screening narrowed the field to just 14 candidate PTP components. Subsequent experiments showed that the loss of only one of them, SPG7, prevented pore opening. Much of what is known about the PTP comes from studies of mitochondria in disease. In pathological states, particularly those involving hypoxia, calcium, and ROS accumulate within mitochondria, causing them to swell and prompting the PTP to open. Because pore opening disrupts the flow of electrons and protons across the mitochondrial membranes, which normally sustains energy production, it results in a catastrophic drop in cellular energy levels. In the absence of disease, precisely how the PTP helps to mediate normal cellular physiology remains unclear. According to Dr. Madesh, “Under physiological conditions, SPG7 may function through transient pore openings to release toxic metabolites that have accumulated in mitochondria.” He plans to explore this possibility with knockout animal models. Scientists at the RIKEN Brain Science Institute in Japan have developed a new method for creating transparent tissue that can be used to illuminate 3D brain anatomy at high resolutions. Published in Nature Neuroscience, the work showcases the novel technology and its practical importance in clinical science by showing how it has given new insights into Alzheimer’s disease plaques. In recent years, generating see-through tissue—a process called optical clearing—has become a goal for many researchers in life sciences because of its potential to reveal complex structural details of our bodies, organs, and cells—both healthy and diseased—when combined with advanced microscopy imaging techniques. Previous methods were limited because the transparency process itself can damage the structures under study. The original recipe reported by the Miyawaki team in 2011, termed Scale, was an aqueous solution based on urea that suffered from this same problem. The research team spent five years improving the effectiveness of the original recipe to overcome this critical challenge, and the result is ScaleS, a new technique with many practical applications. The team has devised several variations of the Scale technique that can be used together. By combining ScaleS with AbScale—a variation for immunolabeling—and ChemScale—a variation for fluorescent chemical compounds—they generated multicolor high-resolution 3D images of amyloid beta plaques in older mice from a genetic mouse model of Alzheimer’s disease developed at the RIKEN BSI by the Takaomi Saido team. After showing how ScaleS treatment can preserve tissue, the researchers put the technique to practical use by visualizing in 3D the mysterious “diffuse” plaques seen in the postmortem brains of Alzheimer’s disease patients that are typically undetectable using 2D imaging. Contrary to current assumptions, the diffuse plaques proved not to be isolated, but showed extensive association with microglia —mobile cells that surround and protect neurons. Cell-based assay platforms are evolving to meet diverse challenges—mimicking disease states, preserving signaling pathways, modeling drug responses, and recreating environments conducive to tissue development. GEN recently interviewed a number of experts on cell-based assay technology to get a sense of the state of the art and to find out where this technology might be most valuable to life sciences research. GEN: What are some of the main challenges that are faced when validating cell-based assays? Dr. Kelly: Considerable challenges come from using systems involving a living organism in the validation of cell-based assays. The characteristics of such systems will likely affect the criteria for validation suitability. These criteria might be specific for primary cells, immortalized cell lines, cancerous cell lines, or cells generated de novo from multipotent stem cells. Chemical reagents are generally well characterized by parameters such as molecular weight, solubility, etc., which are unlikely to change between assays. However, characteristics of primary cells or established cell lines, such as viability, growth phase, proliferation rate, level of metabolism, and even cell size are much more vulnerable. Mr. Trinquet: Beyond developing the right cell-based assay, the main challenge remains the relevancy of the cell model for the target being investigated. Generally, a single assay must also be compatible with a broad variety of cell technologies/models, from engineered cells to more complex models, such as 2D, 3D, microtissue, primary culture, and induced pluripotent stem cell models. This certainly adds some difficulty, given that protein expression levels may differ from one model to another. Also, these assays must generally translate well all along the value chain, from high-throughput screening to late stages of lead op, so that end users do not have to switch between too many assay technologies. Dr. Hsu: Cell-based assays provide more biologically relevant information than biochemical assays for high-throughput screening and ADME/Tox. One challenge in developing and validating cell-based assays is to generate cells that reliably express the drug target and give reproducible results with good Z′ over time. We developed and launched the industry’s first cell-based assays and profiling services for G-protein-coupled receptors. The expression of G-protein-coupled receptors has been worked out, but ion channels are challenging. Another challenge is to make sure the assays and readouts are target specific and predictive, with a good dynamic range and signal-to-noise ratio to differentiate compounds with different potencies and efficacies. Dr. Khimani: Cell-based assays provide a complex and physiologically relevant medium to evaluate the effect of novel therapeutic or modulatory candidates. However, unlike traditional assay formats, cell-based assays introduce a number of challenging factors that must be considered—such as cell type, expression level, stability, and passage viability—when optimizing the assay conditions. In addition, with complex cell-based assay systems, data extraction and signal-to-noise optimization can be time-consuming bottlenecks. Other challenges, particularly with high-content screening, include separate investments in instrumentation, training, data analysis, and data management, all leading to a lower throughput. Dr. Fan: Cell-based assays are model systems, and the most critical challenge facing such assays is how well they reflect real biology. Cell-based assays offer great advantages over biochemical assays because they are conducted in cellular contexts. That said, most of the current cell-based assays use a homogeneous population of cells grown from immortalized cell lines, many of which express target proteins or reporters in excessive, nonphysiological amounts via transient transfection or randomly integrated stable clones. These cell models are far from the actual cellular context in normal or diseased tissue such as a tumor. In addition, phenotypical consequences of an analyte of interest to the cell could reflect a combination of effects that a single cell-based assay would not be able to fully address. These factors impact the validation or correlation of the results of a cell-based assay with a phenotypical consequence, an animal model study, or a clinically relevant finding. Dr. Piper: The most formidable challenge in generating and validating cell-based assays is achieving predictability and translatability. Next-generation re-targeting systems (such as the Jump-In™ platform) have made over-expression of genes, even multigene cassettes, fast, reliable, and easy compared to traditional single-cell cloning. While simple overexpression of a target may be sufficient to drive a primary screen and identify hits, it often lacks a sufficiently complex pathophysiological context to robustly convert hits to lead candidates that are meaningful in clinical trials. These systems have value at early stages, but they would benefit from improvements or secondary screens that can better translate to clinical results. Dr. Payne: The choice of a cell system remains a challenge. Cell lines produce reproducible results, but do not accurately model living systems. Although primary cells are more physiologically relevant, they are inherently variable, making it harder to deliver a robust cell-based assay. Choosing appropriate endpoints can be time consuming: measuring one parameter is not enough to accurately determine the functionality of a drug. The ability to analyze several markers in multiplex assays provides greater information on drug efficacy and toxicity, the latter being important for failing flawed drugs earlier. Finally, once validated offline, assays still require revalidation when transferred to automated context. GEN: What is more valuable to researchers with respect to cell-based assays miniaturization or ultra-high throughput? Dr. Kelly: A single cell contains the complete genome of the species and thousands of expressed genes, implying that one cell could provide the same information as millions. High-throughput efforts should be aimed at our ability to multiplex, multivisualize, and microarray the enormous amount of information that one cell can provide.Mr. Trinquet: Miniaturization may be more important because the cells that are used are more complex and costly to produce massively. It comes to be particularly important when several assays need to be run in parallel using the same sample, such as cell lysate after stimulation. NEW YORK (GenomeWeb) – Scientists have developed a gene editing strategy that could help treat sickle cell disease by short-circuiting the mutated hemoglobin causing the disease. Using CRISPR/Cas9 gene editing tools to systematically excise stretches of a promoter region of the enhancer gene BCL11A — which selects the type of hemoglobin that blood cells create — the researchers found an edit that inactivated BCL11A in human blood stem cells. The cut leads cells to increase levels of fetal hemoglobin, resulting in a milder form of sickle cell disease. The scientists, led by Orkin and Daniel Bauer of Dana-Farber and Boston Children’s, and Feng Zhang of the Broad Institute, published their study today in Nature. The human genome codes for both a fetal version and an adult version of hemoglobin. A mutation in the adult version of the protein causes sickle cell disease. BCL11A became a target of sickle cell disease research after Orkin’s laboratory revealed its direct role in the transition from fetal to adult hemoglobin in a 2009 study published in Nature. In 2013, a study led by Orkin and Bauer found the promoter region which controls expression of BCL11A in red blood cells. In the spring of 2013, divers successfully planted a hydrophone inside the cave and also shot video footage of a coelacanth. (The resulting documentary by Ballesta is available on YouTube. Although it is in French, the footage obviates the need for fluency to enjoy the film.) Day and night, for weeks, the hydrophone dutifully recorded the sounds within the cave. When Parmentier retrieved the files and went to analyze the recordings, there was one big problem: it was filled with dozens of different fish calls. “Maybe the coelacanth is in these sound files, but it’s completely masked by the other sounds,” he says. Nonetheless, the tape captured ceaseless, never-before-heard chatter among the aquatic organisms within the cave (PNAS, 112:6092-97, 2015). To make some sense of it, Parmentier’s team undertook the laborious task of characterizing the sounds recorded over 19 nonconsecutive days (to make this feasible, the group pared down its analysis to the first nine minutes of every hour). The researchers assigned more than 2,700 sounds to 17 groups, most of which sounded to Parmentier like fish (one group was clearly dolphin, based on its high frequency, he says). These included frog-like croaks, grunts that sounded like a creaking door, a moan, and one that sounded like a whistle blown under water. 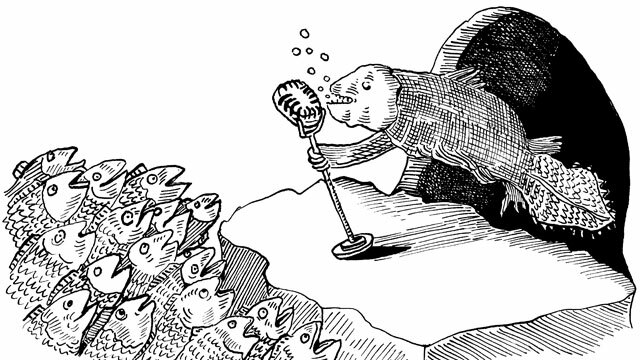 “It’s fair to say, based on the characteristics of the sounds they were hearing, they are probably fish sounds,” says Erica Staaterman, a postdoc at the Smithsonian who studies fish acoustic communication. NEW YORK (GenomeWeb) – The National Institutes of Health has awarded a Beth Israel Deaconess Medical Center (BIDMC) research team $3 million in funding to support the second phase of an effort to identify microRNAs that can be used to predict clinical outcomes of heart disease patients. The grant, which was awarded under the NIH’s Extracellular RNA Communication program, follows a $4 million award the group received to kick off the project in 2013. To date, the team has identified a number of miRNA biomarker candidates including miR-30d, which the researchers reported earlier this year as a predictor of beneficial cardiac remodeling in patients following a heart attack and a key player in preventing cell death. With the latest grant, the investigators aim to validate miR-30d and other candidate miRNAs in several large patient cohorts. Michal Levo, Einat Zalckvar, Eilon Sharon, Ana Carolina Dantas Machado, Yael Kalma, Maya Lotam-Pompan, Adina Weinberger, Zohar Yakhini, Remo Rohs and Eran Segal. “Unraveling determinants of transcription factor binding outside the core binding site”. Genome Res. July 2015 25: 1018-1029. Binding of transcription factors (TFs) to regulatory sequences is a pivotal step in the control of gene expression. Despite many advances in the characterization of sequence motifs recognized by TFs, our ability to quantitatively predict TF binding to different regulatory sequences is still limited. Here, we present a novel experimental assay termed BunDLE-seq that provides quantitative measurements of TF binding to thousands of fully designed sequences of 200 bp in length within a single experiment. Applying this binding assay to two yeast TFs, we demonstrate that sequences outside the core TF binding site profoundly affect TF binding. We show that TF-specific models based on the sequence or DNA shape of the regions flanking the core binding site are highly predictive of the measured differential TF binding. We further characterize the dependence of TF binding, accounting for measurements of single and co-occurring binding events, on the number and location of binding sites and on the TF concentration. Finally, by coupling our in vitro TF binding measurements, and another application of our method probing nucleosome formation, to in vivo expression measurements carried out with the same template sequences serving as promoters, we offer insights into mechanisms that may determine the different expression outcomes observed. Our assay thus paves the way to a more comprehensive understanding of TF binding to regulatory sequences and allows the characterization of TF binding determinants within and outside of core binding sites. An international research team reports that defects in mitochondria, play a key role in the transition from normal cells to cancerous ones. When the scientists disrupted a key component of mitochondria, otherwise normal cells took on characteristics of cancerous tumor cells. In 1924, German biologist Otto Heinrich Warburg observed that cancerous cells consumed glucose at a higher rate than normal cells and had defects in their grana, the organelles that are now known as mitochondria. He postulated that the mitochondrial defects led to problems in the process by which the cell produces energy, called oxidative phosphorylation, and that these defects contributed to the cells becoming cancerous. This is the third contribution to a series on transcription and metabolic control. It reveals the enormous complexity in this emerging research. As the molecular processes that control mRNA translation and ribosome biogenesis in the eukaryotic cell are extremely complex and multilayered, their deregulation can in principle occur at multiple levels, leading to both disease and cancer pathogenesis. For a long time, it was speculated that disruption of these processes may participate in tumorigenesis, but this notion was, until recently, solely supported by correlative studies. Strong genetic support is now being accrued, while new molecular links between tumor-suppressive and oncogenic pathways and the control of protein synthetic machinery are being unraveled. The importance of aberrant protein synthesis in tumorigenesis is further underscored by the discovery that compounds such as Rapamycin, known to modulate signaling pathways regulatory of this process, are effective anticancer drugs. A number of fundamental questions remain to be addressed and a number of novel ones emerge as this exciting ﬁeld evolves. A prominent feature of cancer cells is the use of aerobic glycolysis under conditions in which oxygen levels are sufficient to support energy production in the mitochondria (Jones and Thompson 2009; Cairns et al. 2010). This phenomenon, named the “Warburg effect,” after its discoverer Otto Warburg, is thought to fuel the biosynthetic requirements of the neoplastic growth (Warburg 1956; Koppenol et al. 2011) and has recently been acknowledged as one of the hallmarks of cancer (Hanahan and Weinberg 2011). mRNA translation is the most energy-demanding process in the cell (Buttgereit and Brand 1995).In mammalian cells it consumes >20% of cellular ATP, not considering the energy that is required for the biosynthesis of the components of the translational machinery (e.g., ribosome biogenesis; Buttgereit and Brand 1995). Control of mRNA translation plays a pivotal role in the regulation of gene expression (Sonenberg and Hinnebusch 2009). In fact, a recent study demonstrated that mammalian proteome is mostly governed at the mRNA translation level (Schwanhausser et al. 2011). Malfunction of mRNA translation critically contributes to human disease, including diabetes, heart disease, blood disorders, and, most notably, cancer (Fig. 1; Crozier et al. 2006; Narla and Ebert 2010; Silvera et al. 2010; Spriggs et al. 2010). The first account of changes in the translational apparatus in cancer dates back to 1896, showing enlarged and irregularly shaped nucleoli that are the site of ribosome biogenesis (Pianese 1896). Rapidly proliferating cancer cells have more ribosomes than normal cells. Figure 1. Dysregulated mRNA translation plays a pivotal role in cancer. Malignant cells are characterized by enlarged nucleoli and a larger number of ribosomes than their normal counterparts. Mutations and/or altered expression of ribosomal proteins (e.g., RPS19, RPS 24), rRNA-modifying enzymes (e.g., dyskerin), translation initiation factors (e.g., eIF4E), or the initiator tRNA (tRNAiMet) result in malignant transformation. Signaling pathways whose dysfunction is frequent in cancer (e.g., MAPK, PI3K/AKT) affect mRNA translation. Perturbations in the translatome result in aberrant cellular growth, proliferation, and survival characteristic of tumorigenesis. In stark contrast to normal cells, in cancer cells ribosomal biogenesis is uncoupled from cell proliferation (Stanners et al. 1979). Accordingly, cancer cells exhibit abnormally high rates of protein synthesis (Silvera et al. 2010). That ribosomal dysfunction plays a central role in cancer is further corroborated by the findings that genetic alterations, which encompass the components of the ribosome machinery (i.e., “ribosomopathies”), are characterized by elevated cancer risk (Narla and Ebert 2010). mRNA translation is the most energy-consuming process in the cell and strongly correlates with cellular metabolic activity. Translation and energy metabolism play important roles in homeostatic cell growth and proliferation, and when dysregulated lead to cancer. eIF4E is a key regulator of translation, which promotes oncogenesis by selectively enhancing translation of a subset of tumor-promoting mRNAs (e.g., cyclins and c-myc). PI3K/AKT and mitogen-activated protein kinase (MAPK) pathways, which are strongly implicated in cancer etiology, exert a number of their biological effects by modulating translation. The PI3K/AKT pathway regulates eIF4E function by inactivating the inhibitory 4E-BPs via mTORC1, whereas MAPKs activate MAP kinase signal-integrating kinases 1 and 2, which phosphorylate eIF4E. In addition, AMP-activated protein kinase, which is a central sensor of the cellular energy balance, impairs translation by inhibiting mTORC1. Thus, eIF4E plays a major role in mediating the effects of PI3K/AKT, MAPK, and cellular energetics on mRNA translation.Figure 2. eIF4E is regulated by multiple mechanisms. The expression of eIF4E is regulated by several transcription factors (e.g., c-myc, hnRNPK, p53) and adenine-uracil-rich element binding proteins (i.e., HuR and AUF1). eIF4E is suppressed by 4E-BPs, which are regulated by mTORC1. MAP kinase signal integrating kinases 1 and 2 (MNKs) phosphorylate eIF4E. Figure 3. Ras/MAPK and PI3K/AKT/mTORC1 regulate the activity of eIF4E. Various stimuli activate phosphoinositide-3-kinase (PI3K) through the receptor tyrosine kinases (RTKs). Upon activation, PI3K converts phosphatidylinositol 4,5-bisphosphate (PIP2) into phosphatidylinositol-3,4,5-triphosphate (PIP3). This reaction is reversed by PTEN. Phosphoinositide-dependent protein kinase 1 (PDK1) and AKT bind to PIP3 via their pleckstrin homology domains, which allows for the phosphorylation and activation of AKT by PDK1. In addition, the mammalian target of rapamycin complex 2 (mTORC2) modulates the activity of AKT by phosphorylating its hydrophobic motif. AKT phosphorylates tuberous sclerosis complex 2 (TSC2) at multiple sites, which results in its inhibition and consequent activation of Ras homolog enriched in brain (Rheb), which is a small GTPase that activates mTORC1. mTORC1 phosphorylates 4E-BPs leading to their dissociation from eIF4E. In addition to the PI3K/AKT pathway, the activity of mTORC1 is regulated by the serine/threonine kinase 11/LKB1/AMP-kinase (LKB1/AMPK) pathway, regulated in development and DNA damage response 1 (REDD1) and Rag GTPases in response to the changes in cellular energy balance, oxygen and amino acid availability, respectively. Ras and the MAPK pathways are activated by various stimuli through receptor tyrosine kinases (RTKs). In addition the MAPK pathway isactivatedthrough theGprotein–coupled receptors(GPCRs) and byproteinkinaseC (PKC;notshown).TheMAPK pathways encompass an initial GTPase-regulated kinase (MAPKKK), which activates an effector kinase (MAPK) via an intermediate kinase (MAPKK). In response to stimuli such as growth factors, hormones, and phorbol-esters, Ras GTPase stimulates Raf kinase (MAPKKK), which activates extracellular signal-regulated kinases 1 and 2 (ERK 1 and 2) via extracellular signal-regulated kinase activator kinases MEK1 and 2 (MAPKK). Cellular stresses, including osmotic shock, inflammatory cytokines, and UV light, activate p38 MAPKs via multiple mechanisms including Rac kinase (MAPKKK) and MKK3 and 6 (MAPKK). p38 MAPK and ERK activate the MAPK signal–integrating kinases 1 and 2 (MNK1/2), which phosphorylate eIF4E. Additional abbreviations are provided in the text. Cancer Cell Nov, 2014; 26: 707–721. Breast cancer cells secrete exosomes with speciﬁc capacity for cell-independent miRNA biogenesis, while normal cellderivedexosomes lack thisability. Exosomes derivedfrom cancer cellsand serum frompatients withbreast cancer contain the RISC loading complex proteins, Dicer, TRBP, and AGO2, which process pre-miRNAs into mature miRNAs. Cancer exosomes alter the transcriptome of target cells in a Dicer-dependent manner, which stimulate nontumorigenic epithelial cells to form tumors.This study identiﬁes a mechanism whereby cancer cells impart an oncogenic ﬁeld effect by manipulating the surrounding cells via exosomes. Presence of Dicer in exosomes may serve as biomarker for detection of cancer. Figure 1. Model for RNA Silencing in Drosophila In an ordered biochemical pathway, miRNAs (left panel) and siRNAs (right panel) are processed from double-stranded precursor molecules by Dcr-1and Dcr-2, respectively, and stay attached to Dicer-containing complexes, which assemble into RISC. The degree of complementarity between the RNA silencing molecule (in red) and its cognate target determines the fate of the mRNA: blocked translation or immediate destruction. Fig. 1. Domain organization of RNaseIII gene family. Three classes of RNaseIII genes are shown. The PAZ domain in Dm-Dicer-2 contains mutations in several residues required for RNA binding and may not be functional. Fig. 2. Model for Dicer catalysis. The PAZ domain binds the 2 nt 30 overhang of a dsRNA terminus. The RNaseIII domains form a pseudo-dimer. Each domain hydrolyzes one strand of the substrate. The binding site of the dsRBD is not deﬁned. The function of the helicase domain is not known. Fig. 3. Biogenesis pathway of microRNAs. MicroRNA genes are transcribed by RNA polymerase II. The primary transcript is referred to as ‘‘primicroRNA’’. Drosha processing occurs in the nucleus. The resulting precursor, ‘‘pre-microRNA’’, is exported to the cytoplasm for Dicer processing. In a coordinated manner, the mature microRNA is transferred to RISC and unwound by a helicase. 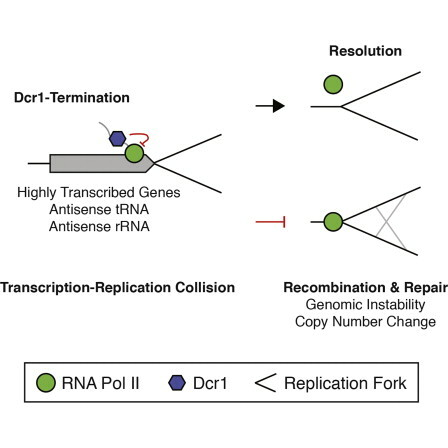 mRNA targets that duplex in the Slicer scissile site are cleaved and degraded, if the microRNA is loaded into an Ago2 RISC. Mismatched targets are translationally suppressed. All Ago family members are believed to function in translational suppression. Fig. 4. Model for Slicer catalysis. The siRNA guide strand is bound at the 50 end by the PIWI domain and at the 30 end by the PAZ domain. The 50 phosphate is coordinated by conserved basic residues. mRNA targets are initially bound by the seed region of the siRNA and pairing is extended to the 30 end. The RNaseH fold hydrolyzes the target in a cation dependent manner. Slicer cleavage is measured from the 50 end of the siRNA. Product is released by an unknown mechanism and the enzyme recycles. RNA interference (RNAi) is a biological process in which RNA molecules inhibit gene expression, typically by causing the destruction of specific mRNA molecules. Historically, it was known by other names, including co-suppression, post transcriptional gene silencing (PTGS), and quelling. Only after these apparently unrelated processes were fully understood did it become clear that they all described the RNAi phenomenon. Andrew Fire and Craig C. Mello shared the 2006 Nobel Prize in Physiology or Medicine for their work on RNA interference in the nematode worm Caenorhabditis elegans, which they published in 1998. The RNAi pathway is found in many eukaryotes, including animals, and is initiated by the enzyme Dicer, which cleaves long double-stranded RNA (dsRNA) molecules into short double stranded fragments of ~20 nucleotide siRNAs. Each siRNA is unwound into two single-stranded RNAs (ssRNAs), the passenger strand and the guide strand. The passenger strand is degraded and the guide strand is incorporated into the RNA-induced silencing complex (RISC). The most well-studied outcome is post-transcriptional gene silencing, which occurs when the guide strand pairs with a complementary sequence in a messenger RNA molecule and induces cleavage by Argonaute, the catalytic component of the RISC complex. In some organisms, this process spreads systemically, despite the initially limited molar concentrations of siRNA. The enzyme dicer trims double stranded RNA, to form small interfering RNA or microRNA. These processed RNAs are incorporated into the RNA-induced silencing. MiRNA biogenesis and function. (A) The canonical miRNA biogenesis pathway is Drosha- and Dicer-dependent. It begins with RNA Pol II-mediated transcription.. Fig. 1. Small RNA cloning procedure. Outline of the small RNA cloning procedure. RNA is dephosphorylated (step 1) for joining the 30 adapter by T4 RNA ligase 1 in the presence of ATP (step 2). The use of a chemically adenylated adapter and truncated form of T4 RNA ligase 2 (Rnl2) allows eliminating the dephosphorylation step (step 4). If the RNA was dephosphorylated, it is re-phosphorylated (step 3) prior to 50 adapter ligation with T4 RNA ligase 1 and ATP (step 5). After 50 adapter ligation, a standard reverse transcription is performed (step 6). Alternatively, after 30 adapter ligation, the RNA is used directly for reverse transcription simultaneously with 50 adaptor joining (step 7). In this case, the property of reverse transcriptase to add non-templated cytidine residues at the 50 end of synthesized DNA is used to facilitate template switch of the reverse transcriptase to the 30 guanosine residues of the 50 adapter (SMART technology, Invitrogen). Abbreviations: P and OH indicate phosphate and hydroxyl ends of the RNA; App indicates 50 chemically adenylated adapter; L, 30 blocking group; CIP, calf alkaline phosphatase and PNK, polynucleotide kinase. Fig. 1. Schematic representation of gene silencing by an shRNA-expression vector. The shRNA is processed by Dicer. The processed siRNA enters the RNA-induced silencing complex (RISC), where it targets mRNA for degradation. Fig. 3. 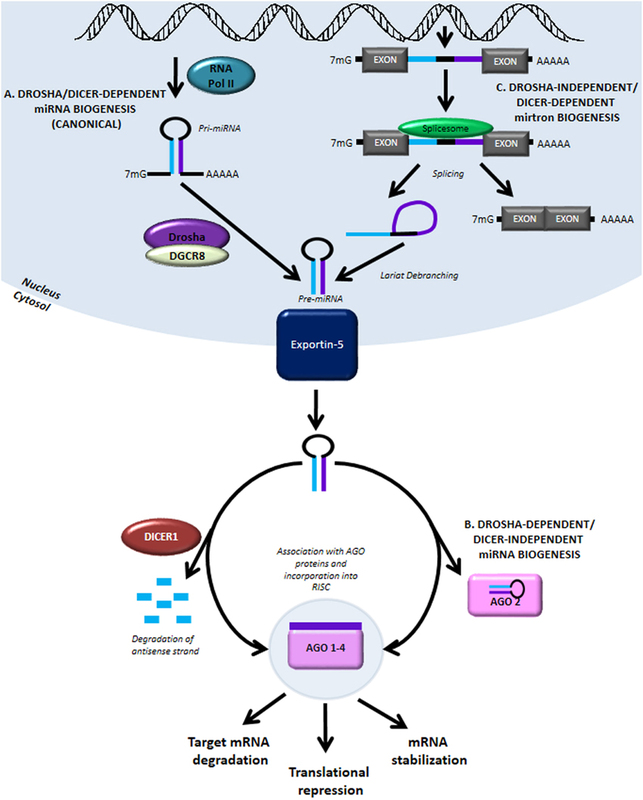 (A) Schematic representation of the proposed siRNA-expression system. Three or four C to U or A to G mutations are introduced into the sense strand. 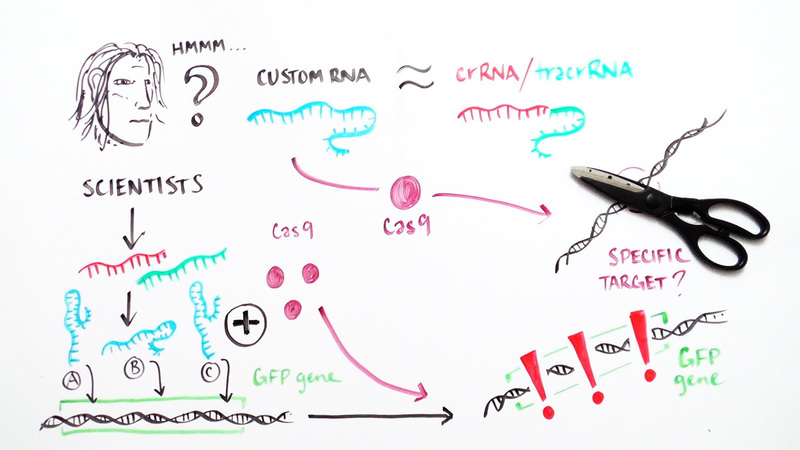 (B) Schematic representation of the discovery of a novel gene using an siRNA library. Figure 2 Biotin pull-downs identify bone fide miRNA targets. (A) Volcano plot showing the significance of the difference in expression between the miR-17-5p pull-down and the mock-transfected control, for all transcripts expressed in HEK293T cells. Both targets predicted by TargetScan or validated previously via luciferase assay were significantly enriched in the pull-down compared to the controls. (B) Results from luciferase assays on previously untested targets predicted using TargetScan and uncovered using the biotin pull-down. The plot indicates mean luciferase activity from either the empty plasmid or from pMIR containing a miRNA binding site in the 3′ UTR, relative to a negative control. Asterisks indicate a significant reduction in luciferase activity (one-sided t-test; P<0.05) and error bars the standard error of the mean over three replicates. (C-E) Targets identified through PAR-CLIP or through miRNA over-expression studies show greater enrichment in the pull-down. Cumulative distribution of log fold-change in the pull-down for transcripts identified as targets by the indicated miRNA over-expression study or not. Red, canonical transcripts found to be miR-17-5p targets in the indicated study (Table S5 in Additional file 1); black, all other canonical transcripts; p, one-sided P-value from Kolmogorov-Smirnov test for a difference in distributions. (F) To confirm that our results were dependent on RISC association, cells were transfected with either single or double-stranded synthetic miRNAs, then subjected to AGO2 immunoprecipitation. The biotin pull-down was performed in the AGO2-enriched and AGO2-depleted fractions. (G-H) Quantitative RT-PCR revealed that, with double-stranded (ds) miRNA (G), four out of five known targets were enriched relative to input mRNA (*P≤0.05, **P<0.01, ***P<0.001) in the AGO2-enriched but not in the AGO2-depleted fractions, but this enrichment was not seen for the cells transfected with a single-stranded (ss) miRNA (H). The numbers on the x-axis correspond to those in Figure 2F. Error bars represent the standard error of mean (sem). Figure 5 IsomiRs and canonical miRNAs target many of the same transcripts. Figure 1. Features of hammerhead ribozymes. 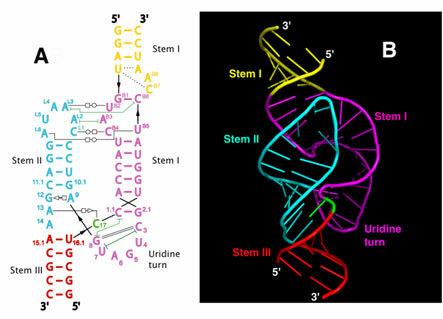 A generic diagram of a hammerhead ribozyme bound to its target substrate: NUH is the cleavage triplet on target sequence, stems I and III are sites of the speciﬁc interactions between ribozyme and target, stem II is the structural element connecting separate parts of the catalytic core. Arrows represent the cleavage site, numbering system according to Hertel et al. .
TABLE 1 Typical examples of successful applications of hammerhead ribozymes. Most of the data are derived from  and , the others are expressly speciﬁed. Figure 2.Target–ribozyme interactions. (a) As cheme of ribozyme binding to full substrate. The calculated energy of this binding ensures the formation of a stable complex. At the denaturating temperature, Tm, will allow this complex to survive to biological conditions. Conversely, after cleavage, binding energies calculated on single, (b) and (c), ribozyme arms are very low and no longer stable. These properties will ensure both the efﬁcient release of cleavage fragments and the prevention of binding to unrelated targets. RNAs complementary to one binding arm only will not be bound or cleaved by the hammerhead catalytic sequence. Figure 3. ‘Chemical omics’ approach. According to this target discovery strategy: (1) a ﬁrst round of ‘omic’ study (proteomic, genomic, metabolomic, …) will enable the discovery of a set of (2) putative markers. A series of hammerhead ribozymes will then be prepared in order to target each marker. (4) A second ‘omic’ study round will be performed on (3) knocked down samples obtained after ribozymes administration. (5) A new series of markers will then be produced. An expanding analytical process of this type may be further repeated. Finally, a robust bioinformatic algorithm will make it possible to connect the different markers and draw new hypothetical links and pathways. Sara Tomaselli, Barbara Bonamassa, Anna Alisi, et al. Figure 1. Structure of ADAR family proteins: ADAR1, ADAR2, and ADAR3. The ADAR enzymes contain a C-terminal conserved catalytic deaminase domain (DM), two or three dsRBDs in the N-terminal portion. ADAR1 full-length protein also contains a N-terminal Zα domain with a nuclear export signal (NES) and a Zβ domain, while ADAR3 has a R-domain. A nuclear localization signal is also indicated. microRNAs are a class of small regulatory RNAs that are involved in post-transcriptional gene silencing. These small (approximately 22 nucleotide) single-strand RNAs guide a gene silencing complex to an mRNA by complementary base pairing, mostly at the 3′ untranslated region (3′ UTR). The association of the RNAinduced silencing complex (RISC) to the conjugate mRNA results in silencing the gene either by translational repression or by degradation of the mRNA. Reliable microRNA target prediction is an important and still unsolved computational challenge, hampered both by insufficient knowledge of microRNA biology as well as the limited number of experimentally validated targets. MicroRNAs (miRNAs) play key regulatory roles in diverse biological processes and are frequently dysregulated in human diseases. Thus, miRNAs have emerged as a class of promising targets for therapeutic intervention. Here, we describe the current strategies for therapeutic modulation of miRNAs and provide an update on the development of miRNA-based therapeutics for the treatment of cancer, cardiovascular disease and hepatitis C virus (HCV) infection. Figure 1. miRNA biogenesis and modulation of miRNA activity by miRNA mimics and antimiR oligonucleotides. MiRNA genes are transcribed by RNA polymerase II from intergenic, intronic or polycistronic loci to long primary miRNA transcripts (pri-miRNAs) and processed in the nucleus by the Drosha–DGCR8 complex to approximately 70 nt pre-miRNA hairpin structures. 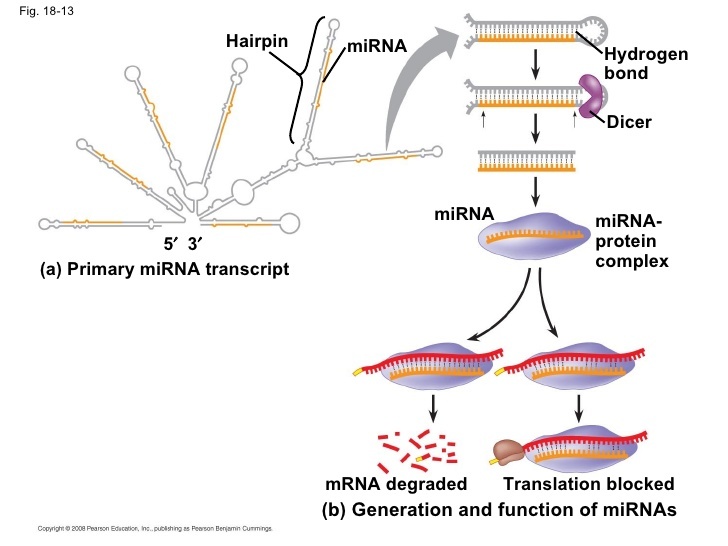 The most common alternative miRNA biogenesis pathway involves short intronic hairpins, termed mirtrons, that are spliced and debranched to form pre-miRNA hairpins. Pre-miRNAs are exported into the cytoplasm and then cleaved by the Dicer–TRBP complex to imperfect miRNA: miRNA* duplexes about 22 nucleotides in length. In the cytoplasm, miRNA duplexes are incorporated into Argonaute-containing miRNA induced silencing complex (miRISC), followed by unwinding of the duplex and retention of the mature miRNA strand in miRISC, while the complementary strand is released and degraded. The mature miRNA functions as a guide molecule for miRISC by directing it to partially complementary sites in the target mRNAs, resulting in translational repression and/or mRNA degradation. Currently, two strategies are employed to modulate miRNA activity: restoring the function of a miRNA using double-stranded miRNA mimics, and inhibition of miRNA function using single-stranded anti-miR oligonucleotides. Figure 2. Design of chemically modified miRNA modulators. (A) Structures of chemical modifications used in miRNA modulators. A number of different sugar modifications are used to increase the duplex melting temperature (Tm) of anti-miR oligonucleotides. The20-O-methyl(20-O-Me), 20-O-methoxyethyl(20-MOE )and 20-fluoro(20-F) nucleotides are modified at the 20 position of the sugar moiety, whereas locked nucleic acid (LNA) is a bicyclic RNA analogue in which the ribose is locked in a C30-endo conformation by introduction of a 20-O,40-C methylene bridge. To increase nuclease resistance and enhance the pharmacokinetic properties, most anti-miR oligonucleotides harbor phosphorothioate (PS) backbone linkages, in which sulfur replaces one of the non-bridging oxygen atoms in the phosphate group. In morpholino oligomers, a six-membered morpholine ring replaces the sugar moiety. Morpholinos are uncharged and exhibit a slight increase in binding affinity to their cognate miRNAs. PNA oligomers are uncharged oligonucleotide analogues, in which the sugar–phosphate backbone has been replaced by a peptide-like backbone consisting of N-(2-aminoethyl)-glycine units. (B) An example of a synthetic double-stranded miRNA mimic described in this review. One way to therapeutically mimic a miRNA is by using synthetic RNA duplexes that harbor chemical modifications for improved stability and cellular uptake. In such constructs, the antisense (guide) strand is identical to the miRNA of interest, while the sense (passenger) strand is modified and can be linked to a molecule, such as cholesterol, for enhanced cellular uptake. The sense strand contains chemical modifications to prevent mi-RISC loading. Several mismatches can be introduced to prevent this strand from functioning as an anti-miR, while it is further left unmodified to ensure rapid degradation.The20-F modification helps to protect the antisense strand against exonucleases, hence making the guide strand more stable, while it does not interfere with mi-RISC loading. (C) Design of chemically modified anti-miR oligonucleotides described in this review. Antagomirs are30 cholesterol-conjugated,20-O-Me oligonucleotides fully complementary to the mature miRNA sequence with several PS moieties to increase their in vivo stability. The use of unconjugated 20-F/MOE-, 20-MOE- or LNA-modified anti-miR oligonucleotides harboring a complete PS backbone represents another approach for inhibition of miRNA function in vivo. The high duplex melting temperature of LNA-modified oligonucleotides allows efficient miRNA inhibition using truncated, high-affinity 15–16-nucleotide LNA/DNA anti-miR oligonucleotides targeting the 50 region of the mature miRNA. Furthermore, the high binding affinity of fully LNA-modified 8-mer PS oligonucleotides, designated as tiny LNAs, facilitates simultaneous inhibition of entire miRNA seed families by targeting the shared seed sequence. More than ten years after the discovery of the ﬁrst miRNA gene, lin-4 (Chalﬁe et al. 1981; Lee et al. 1993), we know that miRNA genes constitute about 1%–2% of the known genes in eukaryotes. Investigation of miRNA expression combined with genetic and molecular studies in Caenorhabditis elegans, Drosophila melanogaster, and Arabidopsis thaliana have identiﬁed the biological functions of several miRNAs (recent review, Bartel 2004). In C. elegans, lin-4 and let-7 were ﬁrst discovered as key regulators of developmental timing in early larval developmental transitions (Ambros 2000; Abrahante et al. 2003; Lin et al. 2003; Vella et al. 2004). More recently lsy-6 was shown to determine the left–right asymmetry of chemoreceptor expression (Johnston and Hobert 2003). In D. melanogaster, miR-14 has a role in apoptosis and fat metabolism (Xu et al. 2003) and the bantam miRNA targets the gene hid involved in apoptosis and growth control (Brennecke et al. 2003). MicroRNAs (miRNAs) interact with target mRNAs at specific sites to induce cleavage of the message or inhibit translation. The specific function of most mammalian miRNAs is unknown. We have predicted target sites on the 39 untranslated regions of human gene transcripts for all currently known 218 mammalian miRNAs to facilitate focused experiments. We report about 2,000 human genes with miRNA target sites conserved in mammals and about 250 human genes conserved as targets between mammals and fish. The prediction algorithm optimizes sequence complementarity using position-specific rules and relies on strict requirements of interspecies conservation. Experimental support for the validity of the method comes from known targets and from strong enrichment of predicted targets in mRNAs associated with the fragile X mental retardation protein in mammals. This is consistent with the hypothesis that miRNAs act as sequence-specific adaptors in the interaction of ribonuclear particles with translationally regulated messages. Overrepresented groups of targets include mRNAs coding for transcription factors, components of the miRNA machinery, and other proteins involved in translational regulation, as well as components of the ubiquitin machinery, representing novel feedback loops in gene regulation. Detailed information about target genes, target processes, and open-source software for target prediction (miRanda) is available at http://www.microrna.org. Our analysis suggests that miRNA genes, which are about 1% of all human genes, regulate protein production for 10% or more of all human genes. Integrated analysis of microRNA and mRNA expression. adding biological significance to microRNA target predictions. Maarten van Iterson, Sander Bervoets, Emile J. de Meijer, et al. Current microRNA target predictions are based on sequence information and empirically derived rules but do not make use of the expression of microRNAs and their targets. This study aimed to improve microRNA target predictions in a given biological context, using in silico predictions, microRNA and mRNA expression. We used target prediction tools to produce lists of predicted targets and used a gene set test designed to detect consistent effects of microRNAs on the joint expression of multiple targets. In a single test, association between microRNA expression and target gene set expression as well as the contribution of the individual target genes on the association are determined. The strongest negatively associated mRNAs as measured by the test were prioritized. We applied our integration method to a well-defined muscle differentiation model. Validation of our predictions in C2C12 cells confirmed predicted targets of known as well as novel muscle-related microRNAs. We further studied associations between microRNA–mRNA pairs in human prostate cancer, finding some pairs that have been recently experimentally validated by others. Using the same study, we showed the advantages of the global test over Pearson correlation and lasso. We conclude that our integrated approach successfully identifies regulated microRNAs and their targets. Fig. 1. A ‘‘Domain-centric’’ view of RNAi. (A) The conserved pathways of RNA silencing. The domain structure of each protein in (hypothetical) interaction with its RNA is shown. For clarity, the second column lists domains in order N- to C-terminal. Figures are not to scale. In brief, Drosha, an RNase III enzyme, and its obligate binding partner, Pasha recognize pri-mRNA loops, and cut these into 70 nt hairpin pre-miRNAs. Dicer utilizes a PAZ domain to sense the 30 2-nt overhang created, and further processes these, and dsRNAs into miRNAs and siRNAs. Argonaute binds the 50 end of guide RNAs via its PIWI domain, and the 30 end via a PAZ domain, yielding RISCs that eﬀect RNA silencing through several mechanisms. A Viral protein, VP19 can suppress RNA silencing by sequestering siRNAs. (B) A summary of known siRNA structural biology. Listed by domain are solved structures, their protein/organism of origin, and ligands, where applicable. Also shown are PDB codes. Fig. 2. Novel modes of RNA recognition. (A) A typical dsRBD: Xenopus binding protein A (1DI2). A RNA helix is modeled pink, and the protein is rendered in transparent electrostatic contours (blue is basic, red acidic). Note the interaction of helices along the major groove, and the position of helix 1. A second dsRBD protein is visible, in the lower right. (B) A dsRBD, Saccharomyces Rnt1P (1T4L), recognizes hairpin loops. A novel third helix (top) pushes helix one into the loop of a hairpin RNA. (C) 30-OH recognition by PAZ. Human Eif2c1 (1SI3) bound to RNA (pink) is shown. PAZ is green, with transparent electrostatic surface plot. The OB-fold (nucleotide binding fold) and the insertion domain are labeled. Note the glove-and-thumb like cleft they form, that the 30-OH is inserted into. A basic groove (blue) the RNA binds along outside the cleft is visible. (D) A close-up view of PAZ, as in C (surface not-transparent, slightly rotated). See white arrows for orientation, and location of 30-OH binding site. RNA is shown red in sticks. The terminal –OH is barely visible, buried in a cleft. It and the carbon it bonds have been colored yellow for clarity. (E) The PIWI domain (2BGG). Note the insertion of the 50P red (labeled) into the binding site. Its complimentary strand (pink) is not annealed to it, and the 30 overhang and ﬁrst complimentary bases sit on the protein surface. (F) An enlarged view of (E), with protein in slate and RNA modeled as red sticks. The coordinated magnesium is a grey sphere, which is coordinated by the terminal carboxylate of the protein, protein side chains, and RNA phosphate oxygens. The 50 base stacks against a conserved Tyr. Several other sidechain contacts are shown. Fig. 3. Argonaute/RISC. (A) P. furiosus Argonaute (PDB 1Z26). A color-guided key to the domains is presented. PAZ sits over the PIWI/N/MID bowl and active site. The liganding atoms for the catalytic metal are depicted as yellow balls for clarity. The tungstate binding site (50P surrogate) is shown as tan spheres. (B) A guide strand channel. Looking down from the PAZ domain towards the active site, Z-sections are clipped oﬀ. Colors of domains are as in the key in (A). Wrapping down along a basic cleft from the PAZ 30OH binding site (approximate position labeled), a RNA binding groove passes the active site (yellow), and runs down to the 50P binding site (tan balls). A second cleft running perpendicular to this one at its entry may accommodate target strand RNA. For more detail, and models of siRNA placed into the grooves, see [27,29]. Fig. 4. VP19 sequestration of siRNA. (A) CIRV VP19 (1RPU, RNA removed). Two monomers (blue and cyan) form an 8 strand, concave b-sheet with bracketing helices at the ends. (B) Tombus viral VP19 bound to siRNA (1 monomer shown). RNA strands are modeled as sticks, with one strand pink and one red. The bracketing helix places two tryptophans in position to stack over the terminal RNA bases. On the b-sheet surface, and Arg and a Lys interact with the phosphate backbone, and at the center of the RNA binding surface, a number of Ser and Thr mediate an extensive hydrogen bond network. Both the Trp brackets and RNA binding by an extended b-sheet are unique. Table 1 – Target mRNAs of IGF2BP3. Figure 1. Noncoding RNAs Function in Diverse Contexts Noncoding RNAs function in all domains of life, regulating gene expression from transcription to splicing to translation and contributing to genome organization and stability. Self-splicing RNAs, ribosomes, and riboswitches function in both eukaryotes and bacteria. Archaea (not shown) also utilize ncRNA systems including ribosomes, riboswitches, snoRNPs, and CRISPR. Orange strands, ncRNA performing the action indicated; red strands, the RNA acted upon by the ncRNA. Blue strands, DNA. Triangle, small-molecule metabolite bound by a riboswitch. Ovals indicate protein components of an RNP, such as the spliceosome (white oval), ribosome (two purple subunits), or other RNPs (yellow ovals). Because of the importance of RNA structure in these ncRNAs, some structures are shown but they are not meant to be realistic. http://www.pnas.org/cgi/doi/10.1073/pnas.1316991110The study of mRNA and microRNA (miRNA) expression proﬁles of cells and tissue has become a major tool for therapeutic development. The results of such experiments are expected to change the methods used in the diagnosis and prognosis of disease. We introduce surprisal analysis, an information-theoretic approach grounded in thermodynamics, to compactly transform the information acquired from microarray studies into applicable knowledge about the cancer phenotypic state. The analysis of mRNA and miRNA expression data from ovarian serous carcinoma, prostate adenocarcinoma, breast invasive carcinoma, and lung adenocarcinoma cancer patients and organ speciﬁc control patients identiﬁes cancer-speciﬁc signatures. We experimentally examine these signatures and their respective networks as possible therapeutic targets for cancer in single cell experiments. Aberrant microRNA (miRNA) expression is implicated in tumorigenesis. The underlying mechanisms are unclear because the regulations of each miRNA on potentially hundreds of mRNAs are sample speciﬁc. We describe a novel approach to infer Probabilistic Mi RNA–mRNA Interaction Signature (‘ProMISe’) from a single pair of miRNA–mRNA expression proﬁle. Our model considers mRNA and miRNA competition as a probabilistic function of the expressed seeds (matches). To demonstrate ProMISe, we extensively exploited The Cancer Genome Atlas data. As a target predictor, ProMISe identiﬁes more conﬁdence/validated targets than other methods. Importantly, ProMISe confers higher cancer diagnostic power than using expression proﬁles alone. Gene set enrichment analysis on averaged ProMISe uniquely revealed respective target enrichments of oncomirs miR-21 and 145 in glioblastoma and ovarian cancers. Moreover, comparing matched breast (BRCA) and thyroid (THCA) tumor/normal samples uncovered thousands of tumor-related interactions. For example, ProMISe– BRCA network involves miR-155/183/21, which exhibits higher ProMISe coupled with coherently higher miRNA expression and lower target expression; oncomirs miR-221/222 in the ProMISe–THCA network engage with many downregulated target genes. Together, our probabilistic approach of integrating expression and sequence scores establishes a functional link between the aberrant miRNA and mRNA expression, which was previously under-appreciated due to the methodological differences.